No complete house plan, was unearthed. But the presence of a mud wall with centrally placed posts at regular intervals within the mud-wall and smaller post-holes along the edge of the mud wall excavated in a trench reveals that the Aharians built their houses with timber and mud with thatched bamboo screens on two sides of the wall for strengthening the same. The antiquarian finds of this period consist of white painted black-and-red ware, black on buff ware and incised red ware, microliths, terracotta figurines and steatite and semiprecious stone beads. Constitute the Malwa level. 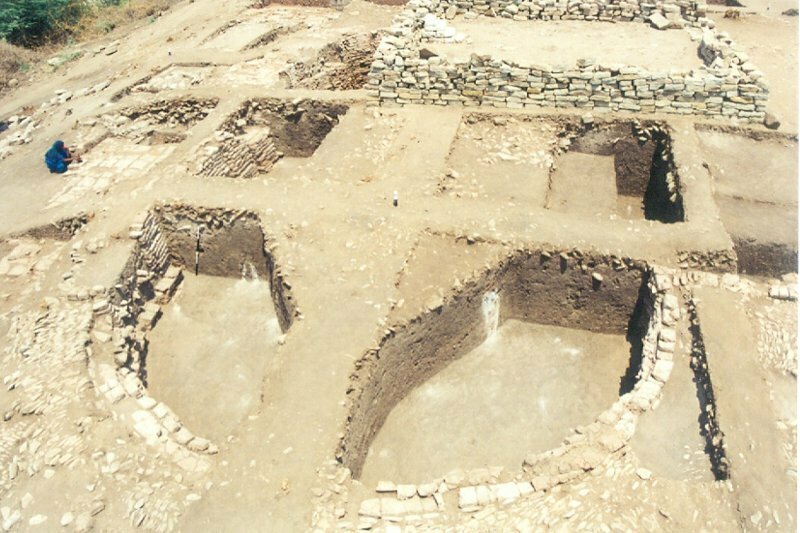 An oval to circular house plans were excavated. The flooring was made with small river pebbles mixed with black cotton soil rammed by keeping the central portion little raised and mud-plastered. From a little distance, the side posts were erected and the thatched-roof was joined at the centre. The remnants of charred bamboo and reed, thatched-house were unearthed in plenty as a supportive evidence for the above. Antiquarian finds of this period consist of typical black on red ware, black on buff wash ware, red-slipped ware, red ware, dull red ware and a few black-burnished ware. The shapes include storage jars, vases of various sizes, dish-on-stand, pottery stands, basins and bowls. Significant among the ceramics are the representation of a two-horned painted animal (deer) on a fragment of a dish-on-stand and woven gunny bag impression over red slipped ware. The other finds include copper fish-hooks, antimony rods, needle and microliths represented with parallel-sided blades, backed-blades, serrated-blades, points, lunates, trapezes, crested-ridged blades and flakes. Steatite beads, semiprecious stone beads of agate, chalcedony, chert, jasper, carnelian, shell and shell bangles constitute the other finds. Structurally the Jorwe people continued to build their houses in the same fashion as that of their predecessors. Number of house plans excavated showed a sudden collapse of the structure and burning activity as attested to by the plenty of occurrence of thatched-houses, burnt pieces with bamboo and reed impressions. Black on buff ware, black on red ware, black on orange slipped ware constitute the major ceramics of this period, together with red ware, burnished black ware, red-slipped ware, dull grey and red ware. On a black on buff wash ware, the depiction of a row of stags is a significant find from this period. Typologically, all the ceramic types continue to occur from Period II. High-necked globular-bodied jars painted with or without graffiti marks appear for the first time. Steatite beads and microliths constitute the largest number amongst the antiquarian finds of Jorwe level along with beads of shell, semiprecious stones of carnelian, chert, agate and chalcedony, terracotta net sinkers and shell bangle fragments. Copper fish-hooks, needles, rings and antimony rods represent the metal objects of this period. Chiefly represents the introduction of iron. No brick structures have been encountered in this period. Circular house plans encountered in the excavation with their near affinity and continuity of the practice of hut building during this period without much change except for the fact that they have used lime extensively in each phase of repair of their houses: circular, squarish or rectangular on plan. Major ceramic types represented in this period were red ware, red-slipped ware, black burnished ware, black-and-red ware, tan ware, black-slipped ware and dull red ware. A couple of NBPW and PGW sherds were recovered from the surface of the mound. Storage-jars, basins, vases of different shapes and sizes, carinated handis, bowls and miniature pots constitute the pottery types of this period, along with stamped and applique decorated sherds. A special mention may be made here of a find of three-handled, wide-mouthed, globular bodied, large storage-jar of red ware fitted with an elephant head (gajamukha) at the shoulder. The bulk of antiquarian finds of this period account for beads of plain and etched carnelian, agate, chalcedony, crystal, jasper, chert, lapis lazuli, amethyst, opal, quartz, faience, terracotta and shell bangles. Decorated ivory combs of rectangular and crescentic shape, decorated ivory kohl sticks, bone points and ear studs of different shapes in chert, jasper, agate, shell, bone and terracotta have been found. The other terracotta finds include gamesman and birds, net-sinkers, spindle-whorls, hopscotches, wheel and animal figurine. Few antiquities of copper have been found with indeterminate shape. Apart from these, a good number of iron objects such as arrow-heads, pick, points, fish-hooks, finger rings, bangles, spoon and hoe were also found. 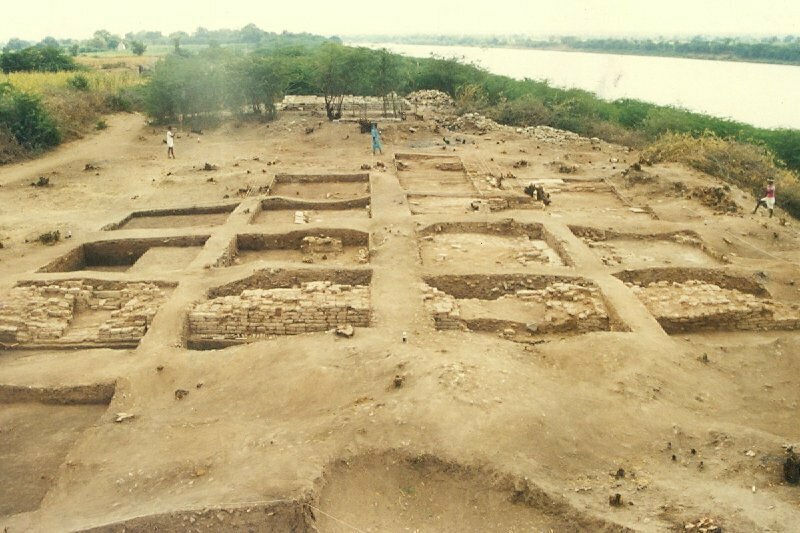 Animal bone fragments encountered in all the periods in large quantities suggest a uniform food habit which persisted at Chichali for more than thousand years. These include bones of bull, sheep/goat, sambhar, deer and so on. Besides wheat was produced during Ahar, Malwa and Early Jorwe periods as attested by the charred grains encountered in the excavation. The other charred grains from late Malwa-early Jorwe periods include rice, lintel, green gram, masur and Indian jujube.